Imagine that you’re going to Beijing for the first time. And imagine that you speak absolutely no Chinese. In this situation, you’d probably be jumping online to search for an English-speaking tour guide, right? At the very least, you’d want someone to show you around on the first day and help you get your bearings. 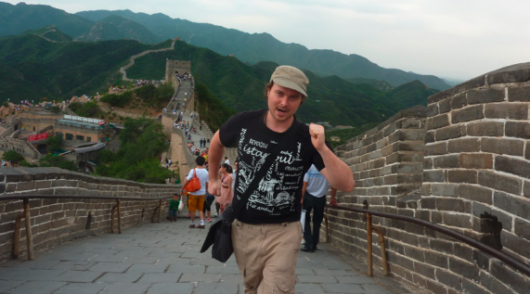 So if you want to learn Mandarin Chinese, why should you approach things any differently? Sure, you could just sign up for the first language course you happen across, or buy the first textbook you can find. But how can you be sure you’re not dropping a pile of money on a resource that’s not going to deliver the results you want? How do you know you’re taking the right first step towards your destination if you’re unfamiliar with the terrain? Enter Benny Lewis of Fluent in 3 Months. In a lot of ways, Benny is like a motivational speaker for learning languages. He strives to focus on the positive, easy parts of language learning and to refute the idea that some people just aren’t “good” at languages. 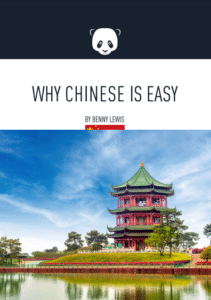 In “Why Chinese Is Easy,” Benny continues in his motivational role but takes on the additional role of Chinese language guide. He takes you on a whirlwind tour through the Mandarin language itself, giving you the opportunity to become familiarized with the most significant parts of it and plan accordingly. And we’re taking the opportunity to explain to you in depth exactly what you’ll be getting. You can also check out our General Learner blog for a rundown of two other FI3M resources: FI3M Premium and Conversation Countdown. I recently sat down and read through “Why Chinese Is Easy.” Here’s what I found out. Who Can Benefit Most from “Why Chinese Is Easy”? People who are interested in Chinese and already know something about languages in general. While Benny mentions that this book assumes that you’ve already at least tried learning Chinese, I think it can also be useful for those who have studied other languages before but who know almost no Mandarin, which is my case. Basically, because “Why Chinese Is Easy” confronts many common fears and frustrations of Chinese learners, you’ll probably stand to benefit from it most if you’ve at least tried to learn a language first. Beginning Chinese learners who are stuck or who have given up. This is more or less the intended audience. Since the idea behind the book is to give you the encouragement and tools you need to get yourself from a beginning to an intermediate level, anyone stuck in the beginner stages may find the necessary motivation and insight here to pick themselves back up and continue along the road to intermediate-land. New Chinese learners who feel overwhelmed. In the beginning stages of learning any language, there’s a lot to feel overwhelmed by. There’s not only the language itself, but the number of resources out there competing for your attention and the headache of navigating them. 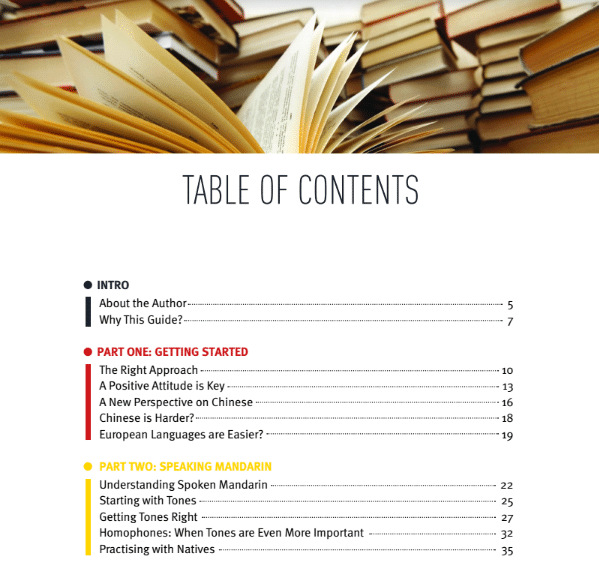 While “Why Chinese Is Easy” is both a motivational and resource guide, its main strength lies in its user-friendly overview of the language and of learning it. It’ll answer the practical questions crowding your mind now, like what’s up with simplified vs. traditional Chinese and how the heck Chinese natives type on keyboards. People looking to learn Chinese through travel and/or without traditional classes. Because a large portion of the book focuses on starting to speak and communicate using Chinese right away, those who are already interested in a less-traditional learning style will probably appreciate “Why Chinese Is Easy” the most. Since travel often puts you in the position of having to speak right away anyway, the book could easily make a handy accompaniment to a Mandarin phrasebook. Which is not at all to say that you need to be traveling to China or Taiwan soon in order to benefit from it, as there’s plenty included about connecting with native speakers and tutors online. Overall, “Why Chinese Is Easy” is a motivational guide for early or potential learners of Chinese to help them visualize and understand the path ahead. It’s not a textbook, and is not for advanced learners of the language. It doesn’t go into great detail about any particular aspects of the Chinese language, but it does provide valuable information about Mandarin from a learner’s perspective. To be clear, whether you actually will be doing these things at the end of three months is probably more dependent on your own dedication than anything else, as “Why Chinese Is Easy” is not a complete learning program so much as a friendly coach (and doesn’t pretend to be more). However, considering the number of beginning language learners who buy a course or program and give up within the first year, it’s worth considering whether the kind of practical and human approach taken by this book is exactly what’s missing from a lot of language learning materials. There will always be more textbooks. They’re being written, re-written and updated by experts all the time. There will always be language classes, which will succeed or fail for an individual learner due to a large number of factors. But the ability to take charge of your own learning is nothing to sneeze at, and that’s what this book attempts to help you do. 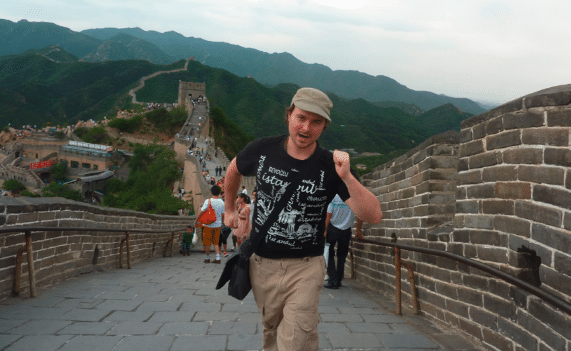 Despite his speaking-before-you’re-comfortable philosophy, which might seem a little crazy at first to some beginners, Benny takes a calm, detailed approach to laying out the various factors to consider in learning Chinese. This is a casual, thoughtful book, which makes its potential audience diverse. Despite the intended approach outlined in “Why Chinese Is Easy,” I can see it being useful as a supplement to many different learning approaches, including a traditional classroom one. Part One: Getting Started covers getting your head right before starting Chinese. It presents logical arguments for putting aside your preconceptions about Chinese being harder than other languages. If you already know or suspect that Mandarin is grammatically simpler than European and Germanic languages in many ways but would like a breakdown of this in layman’s terms, you may find just what you’re looking for here. This section also includes some general suggestions for language learning strategies and attitude adjustment, such as “start before you’re ready.” Again, much of the value here is motivational, but when it comes to the reputation Chinese has for difficulty, it’s hard to underestimate the need for motivation. Part Two: Understanding Spoken Mandarin focuses on tips and resources for getting started with speaking and understanding Chinese as well as demystifying the bogeyman of the language: tones. I’ve personally had people say things to me along the lines of “Yeah, learning Chinese is pretty much impossible for English speakers because…tones?” It can seem like the word “tones” is an argument in itself for giving Chinese a pass. Here, Benny attempts to explain in simple terms what tones actually are and how they can be recognized (or at least understood conceptually) by thinking in terms of equivalent English vocal expressions. He also explains how tones in some ways actually make the language easier. There are plenty of suggestions and useful links in this section for finding native speakers and tutors, looking up pronunciations and practicing your spoken Chinese. Part Three: Chinese Characters aims to answer many of the questions new learners have about that other most intimidating part of the language: the character system. Once again, there’s good news for the uninitiated here: Learning how to physically draw the characters is not so important in this day and age, typing them may be easier than you think and there are plenty of useful tricks for remembering them. Techniques and resources for creating memorization systems are also included in this section. Part Four: Words is all about smart ways to build up your vocabulary, including mnemonics, SRS (Spaced Repetition System) and harnessing the power of your existing word knowledge. On the one hand, learners who are already familiar with concepts like SRS may find less new information here than in some of the other sections. On the other hand, there are many language-specific examples to show how to apply these concepts to Chinese, and Benny’s examples of his own personal mnemonic devices make for a fun and approachable read. Part Five: Grammar is very short, apparently just because Chinese grammar is really not much of a problem for learners compared to other parts of learning Chinese. What’s covered in this section is basically word order and “measure words,” which are “extra” words added between nouns that can act as clues for the type of item to follow. The first is a Chinese Digital Immersion Setup Guide, which includes step-by-step directions for setting up your devices, browser and Facebook page for browsing and typing in Chinese. The second is a Chinese Online Immersion Sample Daily Schedule, which shows how you can potentially fill all your waking hours with Chinese language exposure. After reading “Why Chinese Is Easy,” I feel personally that if I were to throw myself into studying Mandarin tomorrow, I would a) be doing it with confidence and b) be looking back at the book for guidance as I set myself up for learning the language. It’s worth mentioning that many of the resources and concepts recommended in this guide are ones that I’m already familiar with, and that I know other languages learners are as well. However, a large part of what “Why Chinese Is Easy” does is to make the language more accessible by drawing together a whole host of resources and personal observations and putting them in one place. It may be helpful to think of the book as an attempt to translate academic and formal language learning materials into one accessible, actionable package. Ultimately, “Why Chinese Is Easy” will be most useful for those who are new to the Chinese language and also new to the kind of online language immersion tools the book recommends. It provides both an enjoyable, easy read and quick, straightforward reference material for the exact areas where new learners might get stuck. Grab yourself a copy today! Elisabeth Cook is a freelance writer, language learner and literature lover. You can check out more of her writing on her blog, Lit All Over.